For millennia, farmers have looked for ways to raise cucurbit crops off of the ground using for example cucumber staking with simple sticks or with the help of a type of twine like raffia or sisal. Now there is a much more effective and cheaper tutoring method using HORTOMALLAS, a system which also guarantees plant health thanks to the plant being better spread out on the trellis netting. Staking cucumbers using HORTOMALLAS:Staking with netting improves photosynthesis efficiency by increasing exposure to solar rays. Cucurbit plants tend to extend themselves vertically if they can find a support point which helps to guide the plant to develop vertically. By taking advantage of the overheard space for their leaves, flowers and fruits, yields increase and help to increase crop density too, raising the number of plants cultivated per hectare. By staking cucumbers using HORTOMALLAS, the plants are easily handled and do not suffer from being trampled on which they would do otherwise from being on the ground. This lengthens the life expectancy of the plant during its productive stage resulting in more crops harvested from it. Any abrasion or injury to the leaves, fruits or tendrils can increase the risk of contamination with pathogens, since viruses, bacteria and funguses can easily get in through injuries without having to go through the plant’s natural cellular defence systems. Using netting with cucumber crops increases ventilation, reducing excess moisture and mycosis such as chancre/canker, botrytis, odium, mildew, black spot, rust, phytophthora and anthracnose. 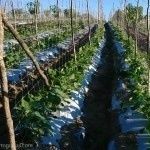 Another advantage of staking using HORTOMALLAS trellis netting with cucumbers is that whenever it is necessary to apply agrochemicals, the application is easier and the coverage of the plant is better. 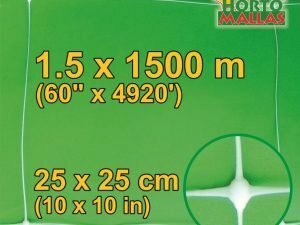 HORTOMALLAS spacious squares allow for easy pruning of leaves without damaging the plant and easy harvesting of the fruits ready for sale. 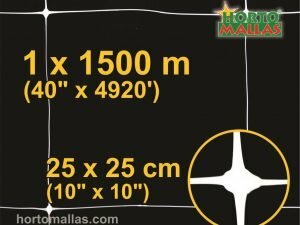 HORTOMALLAS improves the quality, size and appearance of the fruits, as by growing hanging from the plant and not on the ground they develop a uniform colour without the typical yellowish marks of fruit grown on the ground which fetch a lower price on the market as a result. 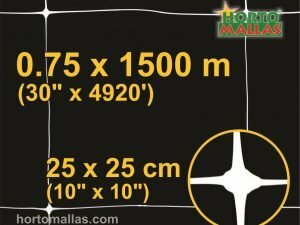 HORTOMALLAS trellis netting increase the planting density per furrow and a higher percentage of pollination. Guess how cucumbers are doing in the United States?